Congratulations! You've crossed the "hump" day in this process. There are only two days left. Some of you may be breezing through it, and some of you have had your challenges. Remember to drink plenty of water and Liver Flush Tea™. If you drink lots of tea, simply add water and herbs to the pot throughout the day. Again, if you're feeling off, try an enema. Cleaning out the waste dumped in your colon from your liver can make all the difference in how you feel. If some of you are experiencing diarrhea, you may want to take less of the Colon Corrective. However, keep taking the psyllium husks. If you have energy, try to go for a walk. Get some exercise to help the toxins move out of your body. Take a sauna if you have access to one, but remember to drink lots of water and juice. This also can help to flush toxins. First thing on rising, drink 8 oz. of pure water to flush your digestive tract. Then, consume 4 droppers of of Blood Support™ and 4 droppers of Liver Tincture™. Note: A dropper equals 1ml, as marked on the dropper. 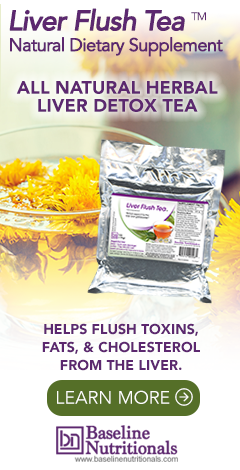 Turn on stove and simmer Liver Flush Tea™ for at least 20 minutes. Then turn heat to as low as it can go to keep the tea warm for you to scoop out as needed throughout the day. Make and drink the Morning Flush Drink. Fifteen minutes after consuming your Morning Flush Drink, follow with 2 cups of the Liver Flush Tea™. Note: You may sweeten the tea with Honey or real Maple syrup. Be sure to strain out any small tea bits before adding to your cup to drink. Continue to keep the Liver Flush Tea on the stove at the lowest heat throughout the day. IMPORTANT: Any time between now and lunch, feel free to have some diluted fruit and/or vegetable juice. You don’t need to wait until lunch to have this, the point isn’t to starve yourself. This is not a fast, this is a cleanse. Drink more potassium broth. 1. Consume 4 droppers of of Blood Support™ and 4 droppers of Liver Tincture™. Note: A dropper equals 1ml, as marked on the dropper. 2. For lunch, you can have more diluted juice and potassium broth. Be sure to add two, 3 gram packets of the Sun Chlorella to your juice. Continue to drink lots of water! Drink more diluted fruit and/or vegetable juice. Continue to drink lots of water and drink some potassium broth. 2. For dinner, you can have more diluted juice. Continue to drink lots of water! Mix 1 Tbsp. Psyllium Husks in 8 oz. of water and juice and drink. Now is a good time to take Colon Corrective and have more Liver Flush Tea™. Drink more water and Liver Flush Tea™. Drink Potassium Broth. As much as possible, do not add spices to the potassium broth. If you must, though, you can add a little "Bragg Liquid Aminos" or real Tamari sauce for flavor. At night, turn off the heat to tea and just top the pot off with water and add 2 more tablespoons of Liver Flush Tea to the mix and repeat the simmering process in the morning. Each day, the tea just gets stronger and richer. When the taste gets too strong for you, pour out and start fresh. I bought and started the liver detox and gallbladder cleanse, but I started without the "sun chlorella" and the "psyllium husk", will my detox and cleanse still be sucessful without said ingredients? A tablespoon of psyllium taken with 8 oz of water or diluted juice at around 6pm along with some Colon Corrective will help keep everything moving. Two packets of Sun Chlorella taken daily with your juice will help give you energy and aid in detoxing and elimination.